Having a baby and a puppy at the same time can be a lot of work. If you spend time setting the puppy up for success before the baby comes home, you have the beginnings of a friendship that will blossom as they grow up together. The sooner you start acclimating your puppy to a new baby, the higher your chance for a positive relationship between the puppy and your baby. This means beginning as soon as you find out you're pregnant. Waiting until the baby comes home to work on acclimating the puppy and introducing them will be much less successful. This phase of the process involves getting the puppy used to things he'll experience when the baby comes home. Babies will make a lot of noise, and these can make your puppy stressed or over-excited. You can acclimate him to these noises by doing the following. Take your cell phone or tablet and wrap it in a baby blanket. Download baby crying sounds onto your device and play them while cradling the blanket and phone like a baby. Start out with the volume on low and slowly increase it. Pair this with either you or a partner throwing some treats so he associates baby noises with good things. You can also play either a CD or mp3 of baby sounds throughout the day in small increments of 10 to 15 minutes. Start with a low volume and gradually increase. Give the puppy something he loves, such as a chew or a toy or a treat, to build up a positive association with the noises. Once you bring the baby home, you will be doing a lot of handling and cradling of the baby. This can interest a puppy and cause him to jump up. Get a realistic baby doll, wrap it in your baby blanket, and cradle the doll in your hands. Associate Applied Animal Behaviorist Katenna Jones relates how she instructs her clients to put an egg in the blanket as well. "Asking the parent to keep the egg from breaking makes them use the subtle body language of holding something fragile that they may not be aware of." Pair holding the doll with your baby noise player for an even more realistic scenario but remember to start in small increments. While you may have already trained your puppy with some obedience behaviors, there are a few you really want to have solid and associated with specific actions. You must commit time to doing this and involve everyone else in the family. While holding the fake baby in your arms, practice sit, down, and sit/down stays with your puppy. This is easier to do with another person there to treat the dog, but you can also keep some treats in the blanket to toss to the dog. Slowly increase the time your puppy can do a stay while you hold the baby. Simulate other situations, such as changing the baby's diaper, with your dog practicing stays. Training your puppy to "go to place" is also very helpful. You can either use a dog bed, a mat, or a crate as the "place." While you hold the fake baby, throw treats onto or in the place and once the puppy understands the game, start adding in your cue, i.e. "crate" or "bed" or "go to place." You can also help the puppy enjoy their designated place by giving him all the things he really loves there such as chews and toys. If he picks them up to take them elsewhere, just take it back and put it on or in the place and repeat. If your puppy is a jumper, teach them sits and stays and turn your back on the puppy until it sits. Practice this with other people and with the baby doll in your hands. If your puppy doesn't use crates, this is an excellent time to crate train it. Finally, work on teaching the puppy to walk well on a leash and practice this while you push a stroller along. It gets the puppy used to the sounds and motions of the stroller and to walk nicely next to you while you use it. When the baby comes, you will have much less time to be with your puppy, which will be distressing to him. To help with this situation, start decreasing what Jones calls "absent-minded time" and increase "quality time." Jones gives an example of reducing situations, such as petting the puppy while you watch television, and increase situations where you are actively engaging with him such as playing fetch, training tricks, or going on walks. If your puppy is still in the nipping stage common to all puppies, work on training him to use a gentle mouth. Make sure you provide him with lots of things to chew so he has an outlet. Provide ice cubes and a frozen damp towel for him to mouth when he's teething. While you may love having your puppy on the couch or bed, Jones cautions this can be a problem when your baby comes home. "The puppy can jump up on the furniture when the baby is there to investigate and easily hurt the baby without meaning to." Provide plenty of comfy beds and spaces for the puppy and redirect him to them when he tries to get on the furniture. Likewise, teach him an "off" command by gently directing him off the bed and praising and treating him. Do this with the puppy on-leash if necessary. 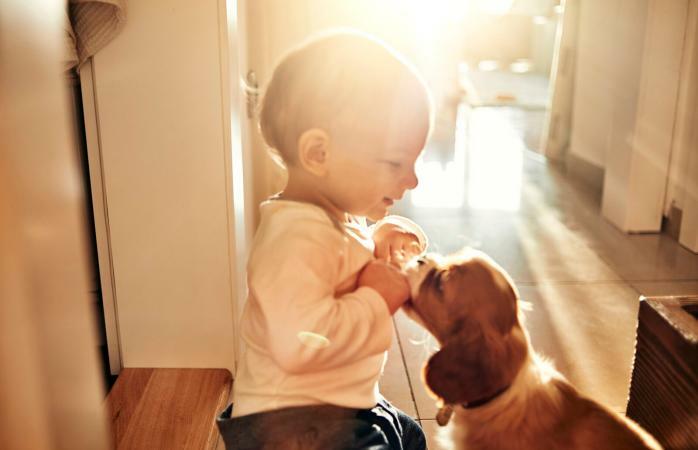 If you have friends with infants and toddlers who feel comfortable, bring your puppy over so he can get used to them at a safe distance while you give him treats. You can even have your friends help the child to toss treats as well. Additionally, start socializing him to children of all ages. As your baby grows up, he or she will bring over friends, and you want your puppy to enjoy children and feel comfortable around them. One good way to do this is to sit with him near a playground so he gets used to the sounds of children noisily playing and running. 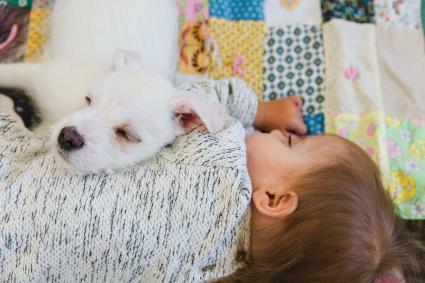 Remember, the best way to set up a beautiful relationship between your child and your puppy is to start as soon as possible. Acclimate your puppy to changes he'll experience once your baby comes home, and he'll likely be comfortable with your infant. 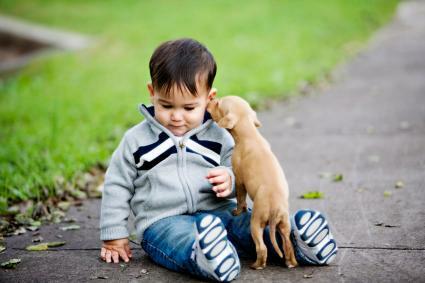 Remember also to supervise all interactions between the baby and the puppy even if you feel they are safe together.